By some estimates, there are more than one billion websites in the world, making the Internet a very crowded place. So how does a solitary mobile Notary get noticed on the web? Greenville, South Carolina Notary Sonita Leak, who started building websites as a hobby, now applies her knowledge of coding, keywords and SEO to create innovative marketing strategies that keep clients coming to her Greenville Notary business. She recently shared some of her affordable and user-friendly secrets with the Notary Bulletin. Have a clear picture of how you want to present your business and the image you want to project, says Leak. That way you can be consistent when placing your branding message on various Internet and social media platforms. You also should have profiles on those social media sites, including LinkedIn, Twitter, Yelp, and Google+. Leak suggests creating a business page on Facebook separate from your personal one. Don’t use your social media platforms to “hard sell” your business, Leak says. Instead, regularly update your business sites with content that is relevant and valuable to your clients, employing selective keywords likely to be used in searches. “I use commonly searched terms, like ‘Notary,’ ‘Notary Public,’ and my specific location, but I also try to switch it up to avoid over-saturation,” says Leak. Leak uses her web platforms to publish articles about loan modifications, refinances and other subjects. This illustrates her experience and expertise at performing a variety of Notary and non-notarial services, including wedding officiating and I-9 verifications. A busy mother of six, Leak has found ways to streamline her marketing strategy, but she still devotes two hours a day to creating new content and researching her market. Leak uses features on WordPress, a website platform, to automatically add keywords to her posts. SEO, or search engine optimization, is the art of making your business the first one that pops up when someone searches the Internet for a Notary in your area. 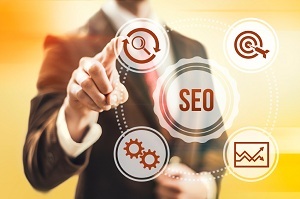 Keywords are the words people commonly use when conducting a web search, so using the rights ones connect potential clients to your business. WordPress and other user-friendly content management systems, such as Drupal and Joomla, are good choices for Notaries. They don’t require any programming expertise and allow for easy updates and blogging — both of which save time and improve SEO. Leak then uses social media management software such as Hootsuite to post blog entries, transaction details, or other updates across social media platforms simultaneously, saving time and creating a consistent brand message. She can even post updates from her smart phone. In order to better target her marketing efforts, Leak tracks visitors to her website using Site Meter Basic. She also utilizes the built-in site statistics available on WordPress. When Leak notices a drop in traffic, she adds funds to her Google Adwords account. Paid search marketing such as Google Adwords or Microsoft’s Bing Ads allows you to purchase premium space on search result pages, based on your chosen keywords. “I spend about $10 dollars a week on advertising,” says Leak. The amount is relatively small because she is in a relatively small market. Notaries in larger markets, such as Los Angeles, can expect to spend more for similar results. She also solicits customer feedback because it’s a good way to figure out what you’re doing right and wrong, and improve your business model accordingly. Leak asks clients for contact information at the end of each signing, so she can send a feedback survey. “I ask if I can add them on my social media platforms,” says Leak, who also solicits testimonials to include on her Notary listings and business website. Publishing positive testimonials can enhance your credibility and add to your SEO. Make Your Website Mobile App-Friendly: Many clients use smart phones to search for local Notaries; your site should show well on mobile platforms. Post Fresh, Quality Content: To build SEO strength, update content regularly with useful blog entries, industry-relevant articles, or discussion starters. Always Include Your Location: Clients will almost always search for the Notary nearest themselves. Make sure your location is as prominent as your contact information.